THE STORY - Looking to mine for gold, greedy industrialist Bartholomew Bogue seizes control of the Old West town of Rose Creek. With their lives in jeopardy, Emma Cullen and other desperate residents turn to bounty hunter Sam Chisolm (Denzel Washington) for help. Chisolm recruits an eclectic group of gunslingers to take on Bogue and his ruthless henchmen. With a deadly showdown on the horizon, the seven mercenaries soon find themselves fighting for more than just money once the bullets start to fly. THE GOOD - A diverse cast of characters and a ton of good ol' fashioned Western shootouts results in an entertaining good time. THE BAD - Ugly cinematography and a missed opportunity to go deeper with the screenplay in trying to create a standalone remake from the original superior 1960 film. 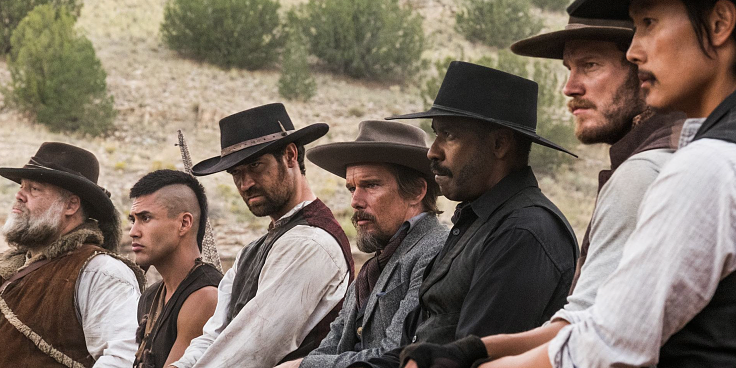 Being released at a point where the summer blockbuster is dying and Oscar season is beginning, "The Magnificent Seven" finds itself in an odd position. Some may go into the movie expecting a prestigious picture when the Western remake is anything but. Comedic dialogue quips, cool and diverse characters and a ton of gun-slinging action proves that this film does not have anything on its mind other than to entertain its audience. In that respect, "The Magnificent Seven" achieves that which it sets out to do. It will not be looked upon as a classic like its 1960 original, but it will surely cap off the (mildly disappointing) 2016 summer blockbuster season with a bang. A remake of the 1960 film of the same name, "The Magnificent Seven" takes place in the Old West town of Rose Creek. It is there that greedy and murderous industrialist Bartholomew Bogue (Peter Sarsgaard) takes control of the town with an army of men at his back through violent means. Now widowed Emma Cullen (Haley Bennet), hires a bounty hunter named Sam Chisolm (Denzel Washington) to kill Bogue and his army and in the process retake their town back. It's a few days ride to the town and along the way Chisolm recruits a diverse group of men to aid him in retaking the town. There's the gambler Josh Farraday (Chris Pratt), the sharpshooter Goodnight Robicheaux (Ethan Hawke), the tracker Jack Horne (Vincent D'Onofrio), the assassin Billy Rocks (Byung-hun Lee), the Mexican outlaw Vasquez (Manuel Garcia-Rulfo) and a Comanche warrior who goes by Red Harvest (Martin Sensmeier). Together they will attempt to do this impossible as they, a group of seven, attempt to take out Bogue and his entire army. Director Antoine Fuqua has assembled an incredibly diverse cast that includes a black lead, a few white men, an Asian, an Indian and a woman. It's a fantastic decision which helps to give the group a reflection of the times in which we live in today. Like "Suicide Squad," the first act of the film is spent with Denzel Washington recruiting the six other men to form the magnificent seven. These character introductions are loose, fun and backed by distinct personality types which helps to provide audiences with a wide cast of characters they can latch onto as their favorite. Everyone gets a chance to shine including Haley Bennet (Who is truly having a breakout year) and Peter Sarsgaard. Make no mistake about it, this is Denzel's movie as he gets the complicated backstory and is the default leader of the group. Even at age 61, the man looks 41 and does not feel out of place at all in this rough and tough world of constant murder and injustice. In fact, that is where the film more than likely finds its thematic undertones is having this wonderfully diverse cast team up together to take out the murderous Bogue. Whether it was Fuqua's intention or not to show a diverse group of people taking out what is essentially an army of white men and have it released during a time where the complex social climate of race and injustice is at a boiling point remains up to debate. Bogue is not portrayed as a racist as he is an evil man to all those he comes across. The movie even refrains from having a single individual mention that Denzel's character is black. But despite all of this, the parallels deserve looking into. From a production standpoint, my big criticism lies with the way this film was shot by Academy Award-winning cinematographer Mauro Fiore. Washed out, grainy and drenched in steep blacks, the film is not a visually appealing one. Even when the action takes place outdoors against the gorgeous scenery backdrops with the sun shining down from above, Fiore is not able to capture a single iconic nor beautiful moment in camera that will last in my memory. The film's music by James Horner certainly feels incomplete but it's a fault which nobody can blame him for considering it was his last score before his tragic death. And although the film's screenplay plays out exactly as you would expect a summer blockbuster to play out, there is nothing new, original nor exciting which this movie provides its audience. The social issues which I explained above, would've given this film a unique voice and could have helped it to stand alone as its own important film for its time. But as it is, Fuqua's 2016 remake will have to settle for being an entertaining romp of a film. "The Magnificent Seven" is fun and entertaining due to its diverse cast of characters and the actors who inhabit those characters. You can tell that everyone was having a blast working on this movie and that feeling translates well onto the audience. I would've preferred that the screenplay dived deeper into the more thematic social issues, which a remake for this time could've certainly delivered. As it stands, the film is what it is. Is it magnificent? I don't think so, but it's not a bad time.